I am a hologram, a modern version of a shell of a man. Mister Heavenly is an American three-piece indie rock/”doom wop” supergroup that formed in 2010. The group features Joe Plummer (drums) from Modest Mouse, Ryan Kattner (vocals, keys) from Man Man, and Nicholas Thorburn (vocals, guitar) from The Unicorns and Islands. Live, actor Michael Cera (of “Arrested Development” and “Scott Pilgrim vs. The World”) occasionally joins the band as their touring bassist. The group started out with Kattner and Thorburn e-mailing music back and forth, before recruiting Plummer and recording in a studio over the course of two weeks. Mister Heavenly is known for inventing a tongue-in-cheek genre called “doom wop,” which falls between low-frequency drone music and 50s doo wop. While the music is primarily built on catchy 50s pop rhythms and chord progressions, the lyrics take a darker look at themes of love and death. Mister Heavenly released their debut album, Out Of Love, on Sub Pop Records in 2011. In music, obscure genre names are constantly thrown around. Inspired by some of the more recent offenders (like chillwave, witch house, and nintendocore), Mister Heavenly have invented their own tongue-in-cheek genre of music called “doom wop.” The cover and title of their debut album Out Of Love gives a brief glimpse into what doom wop is all about: a guy dressed like a 50s greaser is face down on the grass, presumably dead, while a girl is crying next to him. Musically, it uses some rhythms and chord progressions of 50s doo wop music, with nods to grunge, art punk, and drone. Lyrically, it's a collection of dark and doomed love songs. 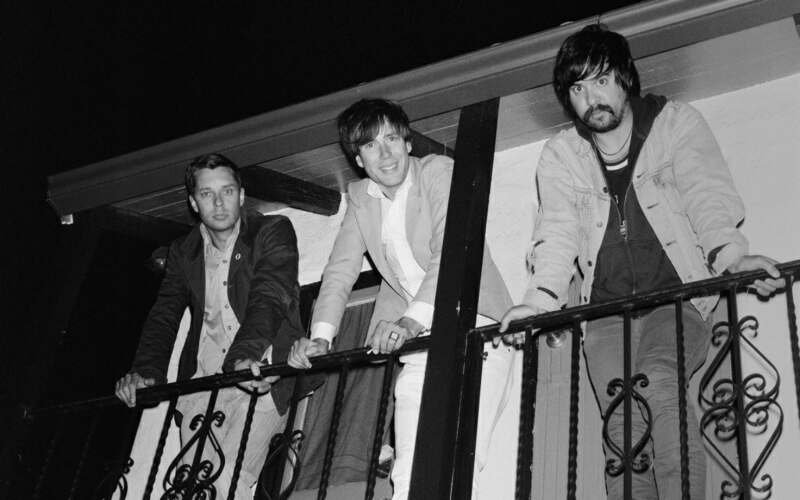 The trio that makes up Mister Heavenly is actually a supergroup formed by members of Modest Mouse (drummer Joe Plummer), The Unicorns and Islands (vocalist/guitarist Nicholas Thorburn), and Man Man (vocalist/keyboardist Ryan Kattner). On tour, actor Michael Cera (of “Arrested Development” and “Scott Pilgrim Vs. The World”) occasionally joins in as their bassist. After e-mailing music back and forth for awhile, Thorburn and Kattner decided to officially form Mister Heavenly, and recruited Plummer to complete the line-up. Out Of Love was recorded and mixed in just two weeks, with most of the recordings done live. As dark as some of the lyrics can be, like “You hate the women that came before you/You'll kill the women that come right after” in “Diddy Eyes”, the music itself is surprisingly fun and catchy. “Hold My Hand” has one of the most obvious nods to 50s pop and doo wop, with prominent piano melodies and sweet harmonies from Thorburn and Kattner. The line “put your head on my shoulder” is even slipped in, perhaps in reference to the 1959 song by Paul Anka. “Bronx Sniper” is one of the album's darker tracks, with a harder rock edge in both the instrumentation and the lyrics: “No one gets out of here alive, in the melee there are many ways to cry/Who knows where the gunshots are coming from, those who've been picked off aren't saying much.” Although it takes nearly a minute to build up, “Pineapple Girl” is one of the best—and cleverest—tracks on the album. It was inspired by the real-life story of a 10 year old American girl (Sarah York) in the 80s who became pen pals with Manuel Noriega (the military dictator of Panama). The song is playful and catchy, with the added twist of Kattner's gruff vocals taking on the point of view of York, while Thorburn's wispy, child-like singing is supposed to reflect Noriega. It's this playfulness to Mister Heavenly's music that makes Out Of Love such a fun record to listen to, no matter what obscure genre it may fall under.